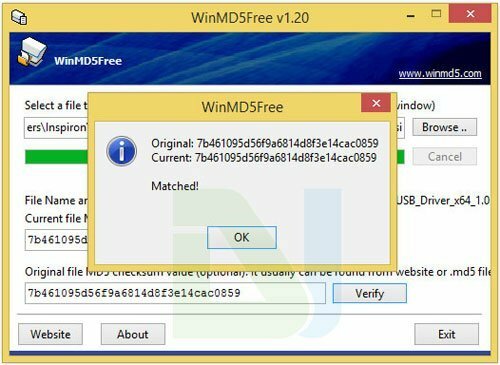 You can easily verify or check MD5 on Windows, MacOS, Linux and Android using WinMD5Free tool for Windows, HashTab for Mac, terminal command on Linux, and on Android using apps. MD5 is a widely known term in the tech world but if you are an enthusiastic Android user, you must have confronted the terms like “md5sum”, “md5 hash” or “md5 checksum” quite frequently. Most official and custom ROMs, mods and recovery flashable ZIPs come pre-encrypted with a unique code for security reasons. It’s a kind of password that is used to ensure the integrity of files inside a ZIP or a software package. An MD5 checksum is a mathematical algorithm is usually a set of 32-character hexadecimal letters and numbers that are computed on a file with a tool. These numbers are generated using special tools that employ “cryptographic hash function producing a 128-bit (16-byte) hash value”. It is used not only to encrypt a ZIP archive or an EXE installer but all kinds of files. You can assign an MD5 sum even to a text or document file. The perfect match of MD5 checksum value ensures that the digital integrity and security of a file has not been broken by someone else and also that it is the accurate copy of the original file. The file might be modified by someone else in an unauthorized way. The file was not downloaded properly and some of its elements might have been corrupted. Why Should We Check MD5 Sum? Installing an official firmware, a custom ROM or even a Kernel file with corrupt MD5 value can lead to a bricked phone or tablet. It is, therefore, very important that whenever you download such files with a purpose to install them on your device, make sure to compare/match the computed MD5 checksum against the one provided on the download page to verify their integrity. I have seen various cases where people report that their device went to bricked state after installing a certain file. In many cases, you might get an installation failed error if the MD5 hash value is not correct. It is a customary practice among Android developers to mention the MD5 sum of their ROMs, mods, and kernels when they share them. Having downloaded such files, you can run an MD5 checker program on your computer to match the MD5 value. It the sum matches perfectly, you can proceed to install the file. In case there is a mismatch between the values, you should avoid installing such files. To make sure that it is just a case of bad download, try downloading the file again, preferably from a different mirror or browser. If the match fails again, contact the developer and report it. You can also contact the developer to ensure that the MD5 they provided with a specific file was correct, or request him to give you an alternate link to download the file. Download the latest version of WinMD5Free from the official site. Extract the downloaded zip and launch the WinMD5.exe file. Click on the Browse..button, navigate to the file that you want to check and select it. Just as you select the file, the tool will show you its MD5 sum. Now copy and paste the original MD5 value provided by the developer or the download page in the box below. Then click on the Verify button. The tool will then give you the match results as shown in the screenshot above. You can also use another nice tool called HashTab to verify MD5. If you are a Mac user, follow these steps to compare MD5 sum. To be able to compare the values, you must have the original checksum. Download the HashTab program on your computer. When the download finishes, you’ll be asked to install the program. You can now start checking MD5 sums on your computer. Note down the location of the downloaded file that needs to be checked. Navigate to this file and perform right-click on it. Then left-click on Properties. In the Properties window, you’ll see a new tab called “File Hashes”. Left-click on it. Doing this will compute the hash value of the file. If the values provided by the developer and the one computed on your computer match, the file is safe to use. In case you find any discrepancies, the file might be corrupt. You also drag the file to the terminal window instead of typing the full path. Then hit the Enter key. Bingo! You’ll see the MD5 sum of the file. Now match it against the original value. With a hope that this tutorial might prove informative and helpful to our users, we can now conclude the topic. For more helpful tips for Android, don’t forget to check our tips and tricks section. If you have any questions to ask or wish to add something to the article to make it more interesting, please feel free to share your thoughts with us. Cheers!